Civil War Store Card for Philip J. Seiter's Meat Market in New York City. Fuld NY630BQ-1b (brass) R-1 NGC MS-63. Seiter's store cards prominently feature a bull's head to represent his meat market. Most tokens released into circulation were struck on brass planchets and this is the most common variety. This specimen has attractive brass color and nice luster. It is mostly well struck and better than average since many specimens have an area of weakness at the center of the reverse. 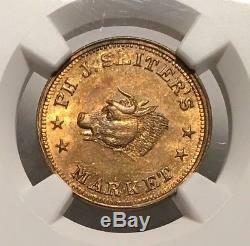 This token is also free of the rust stains which tend to develop on many uncirculated brass tokens. 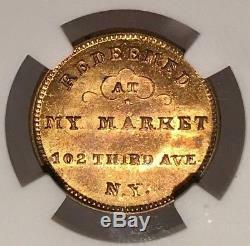 The item "New York Civil War Token Ph. 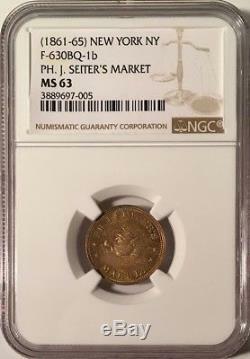 Seiter's Market NY630BQ-1b NGC MS-63 Bull" is in sale since Monday, April 30, 2018. This item is in the category "Coins & Paper Money\Exonumia\Tokens\ Civil War". The seller is "bricksntokens" and is located in Baytown, Texas. This item can be shipped to United States.